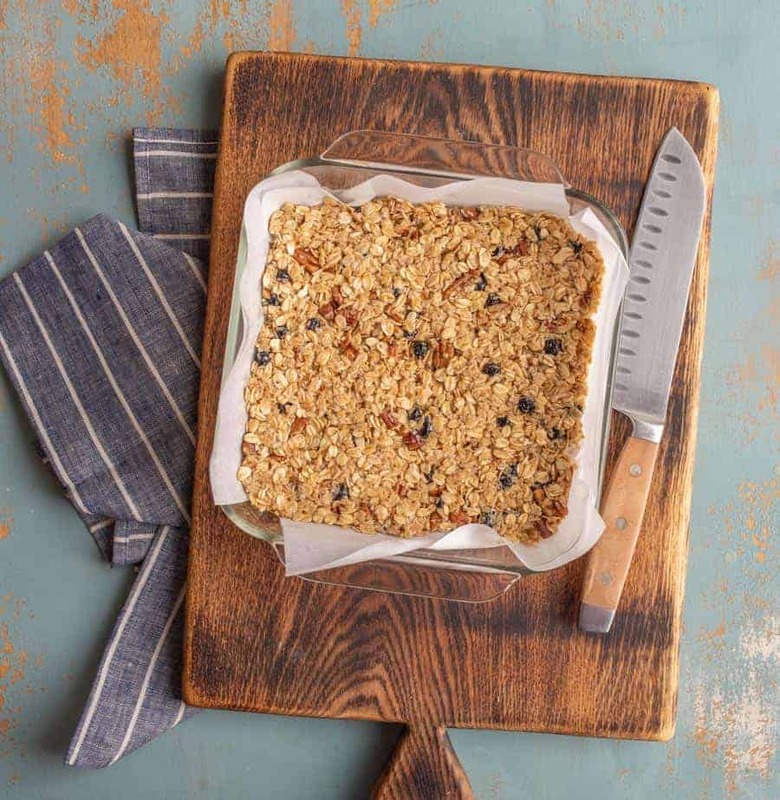 My all-time favorite blueberry pecan granola bar recipe made with whole grain oats, nuts, honey, and a few other simple ingredients. Homemade granola bars are one of those things that I didn’t know that I would love making and eating so much. Once you start down this homemade granola bar path, you’re in it for life. The ingredient list is short, the prep time is minimal, and the outcome is delicious. I love a recipe that turns out great every single time. 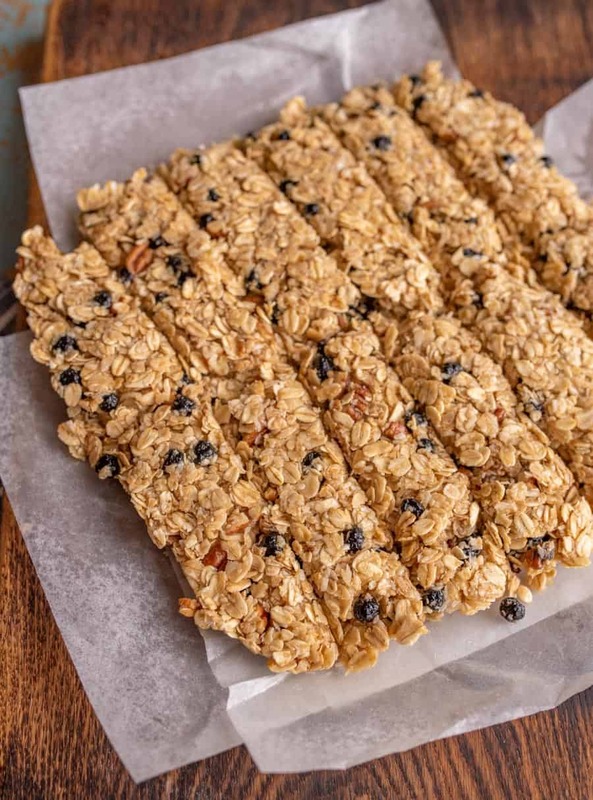 This is my favorite homemade granola bar recipe and it’s made with dried blueberries and toasted pecans. When you toast the oats and nuts in the oven first, something magical happens. The end product almost tastes like a cookie! 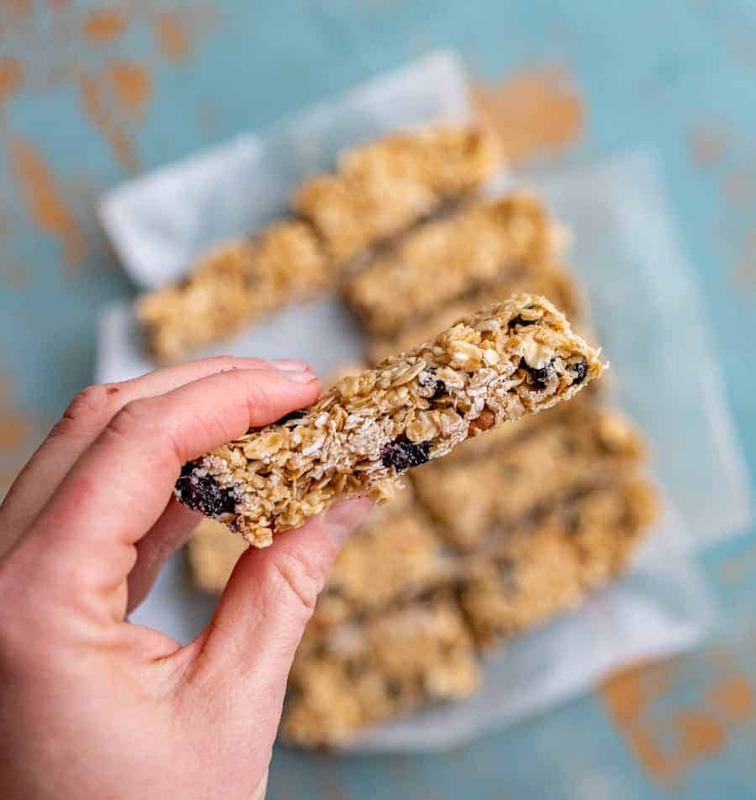 Once you start making granola bars at home, and then compare it to a store-bought granola bar, you’ll just get it. Store-bought granola bars are fine until you taste these and then you can’t go back! These are a great homemade treat for games, practices, road trips, or lunches. I could eat one a day for the rest of my life and die a happy woman. I like to use dried wild blueberries because they are small and full of flavor. I find them at Trader Joe’s (and stock up because I don’t get to TJ’s very often). 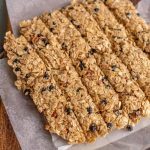 You can skip toasting the nuts and oats, but it really makes the granola bars delicious and almost gives them a cookie-like flavor. Occasionally I’ll get feedback that the bars don’t stick together well. To avoid this, don’t be overly generous in your measuring. A heaping cups of oats can throw off the wet-to-dry ingredient ratio. If your bars aren’t sticking together well after the time in the fridge, press them down again really firmly and then stick them in the freezer. You can cut them frozen and then keep them in the fridge to keep them from falling apart. If there’s no saving a crumbly bar, you can normally roll them into bite-sized balls with lightly wet hands. That’s a good way to save them. These last 4-5 days covered at room temperature, up to 2 weeks in the fridge, and up to 2 months in the freezer. Yes indeed! They freeze great and last up to 2 months in the freezer. Just store them with parchment between the layers or with wax or parchment paper wrapped around each bar so they don’t stick together. While the oats are toasting, add the honey, butter, and brown sugar to a small saucepan. Cook over medium heat until the butter melts and the sugar dissolves and is lightly bubbly, stirring occasionally. When butter mixture is ready, remove it from the heat and stir in the vanilla and salt. Pour the sugar mixture over the oat and nut mixture and stir to combine. Add shredded coconut and dried blueberries and stir to combine. Make sure none of the oats are dry. Place all of the oat mixture in the prepared pan. Use a rubber spatula or the bottom of a greased measuring cup to press the mixture into the pan. Chill the granola bars for at least 2 hours. Lift the bars from the pan using the edges of the foil or parchment and place them on a cutting board. Cut as desired and serve. Store covered in the fridge or in the freezer for longer storage. 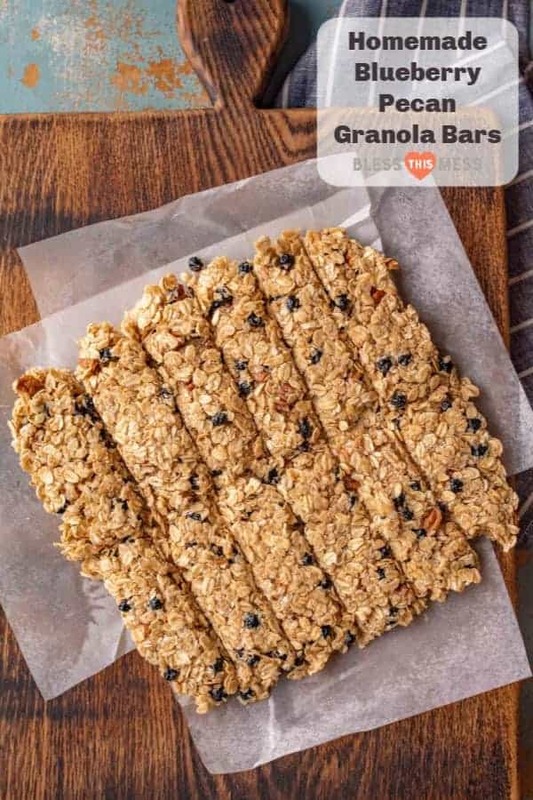 If you are stacking the granola bars, place a piece of parchment paper between the layers. These store very well in the fridge or freezer. You may want to wrap them in a bit of parchment paper before putting them in a container or plastic bag in the fridge so they don’t stick together. Thanks for stopping in and enjoy making this recipe! Have you ever read Cook-a-Doodle-Do? It’s a super fun kids book about a rooster who bakes a strawberry shortcake with his friends. At the end of the book there’s even a recipe for the strawberry shortcake. Every time we get the book from the bookmobile, my kids ask to make the cake. This time, I finally obliged. It turned out so good! 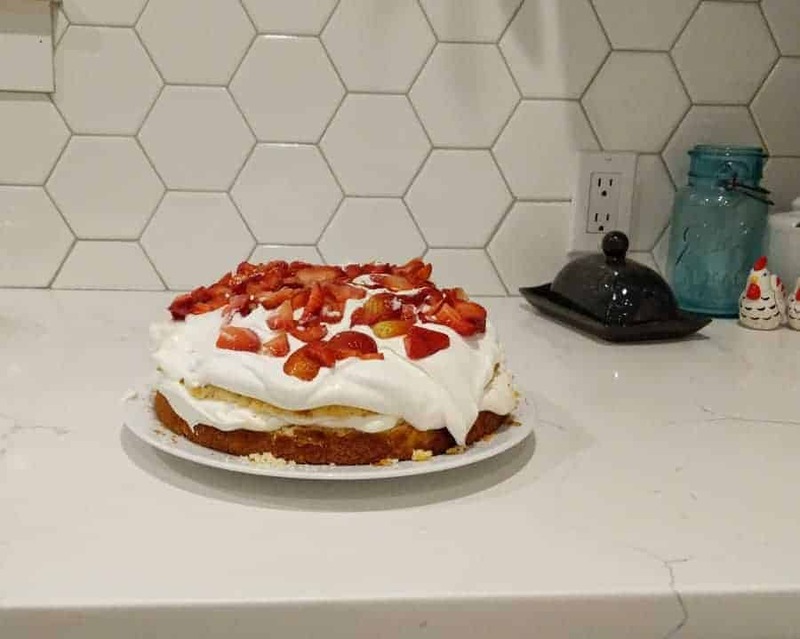 A little heavy on the whipped cream (thanks to help from little hands pouring in the cream), and a little light on the strawberries (thanks to a lot of sampling from little hands while cutting them up), but perfect nonetheless. When it was finished, my 7 year-old proceeded to take no less than 45 pictures of the cake, including a good attempt at a selfie with the cake, to honor the occasion. He’s totally my kid (and that’s definitely one of the pictures he took. He’s a natural).